A conversation with U.S. Army Reserve Social Media Chief Lieutenant Colonel Gerald Ostlund about empowering service members to use social media as unofficial spokespersons, the use of social media during the Fort Hood shootings and what U.S. citizens can do to show support for members of the U.S. Armed Forces. 00:59 – Gerald Ostlund defines his areas of responsibility as social media chief at the U.S. Army Reserve, which includes social media strategy, social media policy, social media content development and quality control. 2:01 – Operational security as the core concern the U.S. Army Reserve has about social media engagement, and protecting against operational security violations by making sure that reservists understand not to divulge where they’ve been or where they’re going via social media channels, particularly when they’re deployed down range. 02:21 -- Soldiers as unofficial U.S. Army Reserve spokespeople, whether they’re on duty or off. Just as public relations practitioners teach their clients that there’s no such thing as going off the record, the U.S. Army Reserve teaches their soldiers that there’s no such thing as “off duty” when they’re using social media. 03:03 -- Importance of staying within the bounds of the Uniform Code of Military Justice, not disparaging the President of the United States, members of U.S. Congress or other elected Government leaders, which may be punishable violations of the code. 03:47 – Whether or not being a member of the U.S. Armed Forces means you must sacrifice your Constitutional Right to Free Speech. 04:27 – The litmus test for whether or not the Uniform Code of Military Justice extends to social media. 05:36 – How the U.S. Army Reserve is approaching the unique challenge of managing decentralized communications via social media among an army of reservists who are continuously rotating in and out of active duty, and how U.S. Army Reservists are balancing their online civilian persona against their online military persona. 06:35 – Staying in your lane by personalizing your experience as a way of empowering soldiers to serve as unofficial spokespeople, while ensuring they don’t step on the toes of the U.S. Army Reserve Public Affairs detail, who fill the official spokesperson role. 07:44 – Advice to U.S. Army Reservists who tweet and use other social media channels on how to differentiate their personal opinions from the official policies of the U.S. Army Reserve. 09:14 – The use of disclaimers such as “Although I am an officer or soldier, I don’t speak for the U.S. Army Reserve” on blogs and in the profile sections of social networking services. 10:21 – Media relations and crisis communications lessons learned from the Fort Hood shootings and the use of social media to get the word out quickly during the tragedy. 13:03 – Leysia Palen’s analysis of official and unofficial communications during the Virginia Tech shootings and the prospect of socially distributed problem solving. Ms. Palen is a past guest on this podcast. 14:57 – Most of the victims of the Fort Hood shooting were revealed through mainstream and social media prior to the U.S. Army’s ability to release an official statement, due to the legal responsibility of notifying next of kin prior to making official announcements. 15:42 – The prospect that General George W. Casey, Jr., Chief of Staff at the U.S. Army, would revisit the way they make use of communication channels to distribute information during good times as well as bad. 16:54 – How U.S. Army Reserve Public Affairs Officers -- who may be required to go in front of the news media and discuss the details surrounding the deaths of soldiers who they’ve trained with, and who may be their personal friends -- control their emotions under the spotlight in times of crisis. 18:18 – The real sacrifice U.S. Armed Forces service members make for choosing a life of military service. 20:24 – The call of duty, obeying the oath to serve and defend when the U.S. President calls and leaving the policy and the politics to elected, civilian leadership. 21:31 – Whether or not the U.S. Armed Forces could effectively to use social media to win trust and confidence in Afghanistan or Iraq, and why we need to be ones mentoring and enabling them to spread the word themselves. 25:35 – The relationship between Iraqi and Afghani nationals and their ex-pat community in the U.S., and utilizing the latter as a resource to get the word out to nationals. 27:08 – His experience working directly with Iraqis and the sacrifices they are making to try and build a better Iraq. 27:53 – What motivates people to set off bombs and plot terrorism against civilians inside Iraq. Say thank you to a soldier. It means a lot. Volunteer for a family readiness group at your local Army Reserve. Whether you’re left or right. VOTE! Put representatives in office who you think will better the USA, so the policies our service members are defending are worth the sacrifice. 32:08 – Whether or not young people are getting more or less engaged in the political process. 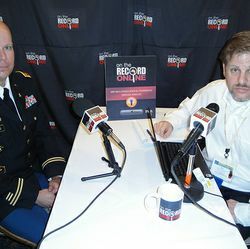 This episode of On the Record…Online, the Official PR Podcast of the 2009 PRSA International Conference, was recorded live at the conference and released on Veteran’s Day.